When the Television Critics Association gathers in California every July to hear all about the Fall TV schedule, there is always a wealth of detail to be revealed – not least about the attitudes and expectations of those involved with each project. This year’s TCA summer tour was no exception, and provided insight into the hopes for the Evil Dead franchise – based on the upcoming Starz TV series, Ash Vs. Evil Dead. 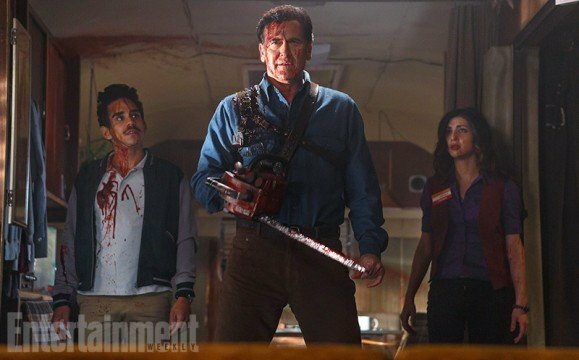 The show shares continuity with the original Evil Dead franchise (Evil Dead, Evil Dead II, Army Of Darkness), and features Campbell as his original character, Ash Williams, thirty years on. Ash is the sole survivor of the events of Evil Dead – which saw him and his friends accidentally unleash vast numbers of demons, with deadly, gory consequences. Ash Vs. Evil Dead sees Ash drawn back into action when a ‘Deadite’ plague sweeps across the world. The panel for the show consisted of star Bruce Campbell, showrunner Craig DiGregorio and co-star Lucy Lawless. The trio were joined by Sam Raimi, who wrote and directed the original 1981 film, as well as the pilot episode of Ash Vs. Evil Dead. Raimi also executive produces the show. When questioning began, Campbell remarked that he expects the insatiable appetite of Evil Dead fans to make the endeavour a real hit – ultimately translating into more forays onto the big screen. “This series will force us to make more movies. That’s only 10 hours of programming; we need eight more movies. This is an interesting stance to take, given that both Raimi and Campbell co-produced the successful 2013 remake of their original Evil Dead film – directed by Fede Alvarez. Though the 2013 version passed the story on to new characters, leaving Campbell’s Ash untouched, the leading man’s apparent eagerness to bring the infamous demon-fighter back to the big screen comes as something of a surprise. At the TCA panel, Campbell’s cinematic ambition for the franchise was coupled with a high degree of confidence in the future of this new TV show. Starz has yet to confirm a series renewal for Ash Vs. Evil Dead – which is currently set to premiere on October 31st 2015. But, if early interest is any indication, this show looks set to resurrect the Evil Dead franchise once and for all.